Cops for Cancer-Tour de Valley riders will be giving sick kids hand-made blankets donate by the Fraser Valley Quilters' Guild. Sep. 22, 2016 5:00 a.m.
Delta Police Sgt. Sarah Swallow accepts a donation of 30 blankets from Fraser Valley Quilters’ Guild President Carole Hando on Sept. 19. The quilt shown here was hand-made by guild member Carmie Kozak. 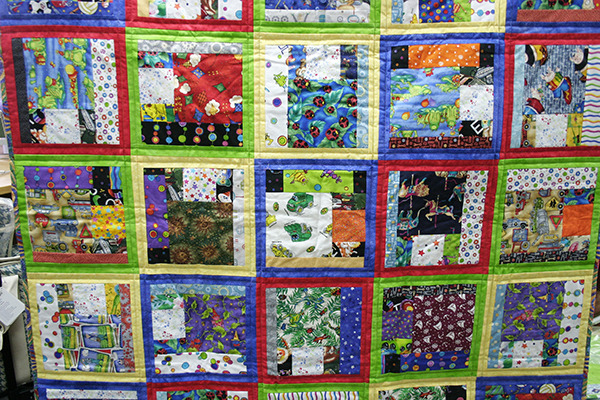 Riders in this year’s Cops for Cancer Tour de Valley will be bringing a little splash of colour to kids battling cancer thanks to a generous donation from a local quilters’ guild. Members of the Fraser Valley Quilters’ Guild have stepped up once again this year, donating 30 hand-made blankets for riders to hand out to sick kids and their families during the 2016 Tour de Valley, which kicks off Sept. 22 at Abbotsford Senior Secondary School. In communities from Tsawwassen to Boston Bar, riders will be making stops to distribute the blankets and raise awareness and funds benefiting pediatric cancer research and treatment as well as Camp Goodtimes, the Canadian Cancer Society’s summer camp for kids with cancer. Twenty riders are taking part in this year’s event, including police officers, a firefighter and a paramedic. Each of them had to fundraise a minimum of $6,000 to participate in the ride, and are set to bike nearly 900 kilometres over the next nine days. Swallow said many kids going through cancer treatment lose the ability to properly regulate their body temperature, making the blankets an extremely welcome gift. But the blankets also serve to help boost the kids’ morale. The ride comes to Delta on Thursday, Sept. 29, with stops at Brooke Elementary, Coast Capital Savings in North Delta, Sunshine Hills Elementary, Delta Police headquarters, Thrifty Foods, Coast Capital Savings in Tsawwassen, South Park Elementary, Southpointe Academy, McDonald’s in Ladner and Surrey RCMP. To keep track of the riders’ progress and see photos and videos of the various events and stops along the way, follow them on Twitter and like them on Facebook. To donate, visit tourdevalley.ca. The Fraser Valley Quilters’ Guild meets the second Tuesday of every month at the Kennedy Seniors Recreation Centre (11760 88 Avenue, North Delta). Check out fvqg.org for more information on the guild.